Ryan Reynolds returns as the Merc with a Mouth, who this time must defend a young mutant from a time-traveling soldier named Cable. Deadpool 2 offers more laughs, fourth wall breaks, and action than the first film, and pays off almost as well. The first film was definitely a game-changer for R-rated blockbusters and superhero films and didn’t flinch to go for all the laughs and content it had too. This time we’re reminded once again why Ryan Reynolds is so great as Deadpool, and the R-rating and comedic style definitely pay off. Deadpool constantly makes references to other movies and always reminds us that we’re watching a superhero movie, poking fun at the structure and familiar faces from other films in the genre. Reynolds always delivers as the comedic mercenary who he was born to play. He won’t only make you crack up every minute, but he’s also got an emotional arc in this movie which without a doubt works. If you loved Josh Brolin as the menacing but layered CGI villain Thanos in Avengers: Infinity War, then he isn’t finished fighting supeheroes this year yet — here he plays Cable, who is also given a strong motive (as well as a CGI arm) and Deadpool even pokes fun at the fact that he feels straight out of a Terminator movie. I wouldn’t say he’s as good as Thanos, but Cable definitely shows his strength in battle and that he’s got emotional motivation too. Another standout is Zazie Beetz as Domino, who’s superpower is that she’s lucky. I know that sounds laughable on paper (Deadpool even calls it “not cinematic enough”), but wait until you see her in action. Also expect some funny and unexpected cameos, some you may catch and some are so brief you may miss them. Deadpool 2 definitely tries what most sequels try — bring back what made the first film great and up the ante. Most of the time this works, and I’d even say a lot of the aspects of the film are better than the first movie. The development for the main character of Deadpool and of the themes and story overall work better than the first movie (which was great but had the somewhat familiar origin story formula), and the directing and characters work better this time around for the most part. It’s also definitely funnier than the first movie, even though a few jokes go on for a little too long, there are many lines that will have the entire audience bursting into laughter. Sometimes the script and pacing feel a little uneven, but in the end you can forgive that because of the purely over-the-top and insane fun you’ll end up having. Whether or not you follow the X-Men universe, the Deadpool movies offer a unique feel to the superhero genre and do not flinch to be as raunchy as they want to be. 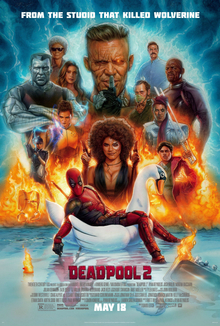 Audiences will definitely have a fun time with Deadpool 2, as Reynolds brings back all the fun we wanted from the character, with great laughs, action, pop culture references, and enjoyment like we loved in the first movie, and also remember to watch the mid-credits scene that’s funnier than any of the other Marvel post-credits scenes.